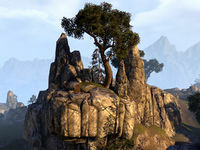 Skyreach Overlook is a mountaintop east of Skyreach Catacombs. The base of the mountain is guarded by a group of Iron Orcs and welwas. At the top you will find the painter Ulymen, along with a Letter to Dusandar.